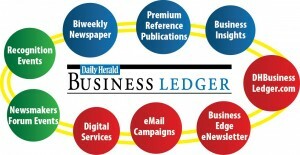 Through a distinctive marketing mix that includes print, digital and events, Daily Herald Business Ledger provides access to a unique targeted audience of business decision makers. For the Reader, Daily Herald Business Ledger is the primary source of local business news and information in suburban Chicago. For the Advertiser, Daily Herald Business Ledger provides access to the executive readers and decision-makers at more than 15,000 businesses. Keeping Tabs – Local news briefing to keep you up-to-date with what’s happening in your suburban region: North, Northwest, West and South. Tech Talk – Tech writer Richard R. Klicki focuses on the technology industry, highlighting local companies and tech trends. Notes of Congratulations – Listings of new positions, appointments, honors and awards. The Daily Herald Business Ledger provides access to the business owners, decision makers and executive readers at Chicago suburban businesses. DuPage County, Kane County, Lake County, Will County and suburban Cook County.